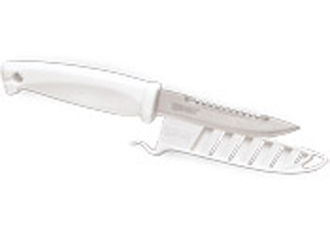 RAPALA 4" BAIT KNIFE This knife has a serrated upper and and razor sharp blade. It is the preferred size for preparing bait and performing other boatside tasks. Open sheath. Handle length = 5"; blade length = 4".